Skin allergy is the body’s over-reaction to one or more allergens. There are thousands of different allergens all around us and almost any substance can provoke an allergic reaction in someone (who is very sensitive) in our environment. Contact dermatitis :- The Greek word ‘Dermatitis’ means ‘inflammation of skin’, is caused by touching a certain substance. In most cases, the main symptom is a red rash, but it could be one of a number of allergens that causes it, including metals, chemicals, rubber, plants and even pets. 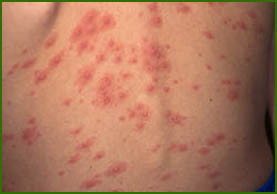 Prickly heat :- Warm weather often causes the itchy red rash known as prickly heat. The exact reason is not known till date, but some people think it’s due to sweat getting trapped under the skin. Bites and stings:- Irritations from insect bites and stings can be uncomfortable but reactions tend to be short lived. Urticaria :- This type of allergy is often called nettle rash, because it comes up as an itchy red rash, raised in the middle. Confusingly, it has nothing to do with stinging nettles at all but is caused by eating a certain food or taking a particular drug.